Haier showed us 2 of their 4 soundbars to be realeased into the market each boasting a feature not yet seen in the soundbar market. 3D SoundBar (SBEV40-3D): Haier showed something they called a “3D Sound bar” which rose quite a few red-flags for me because “What is 3D Sound?!”. 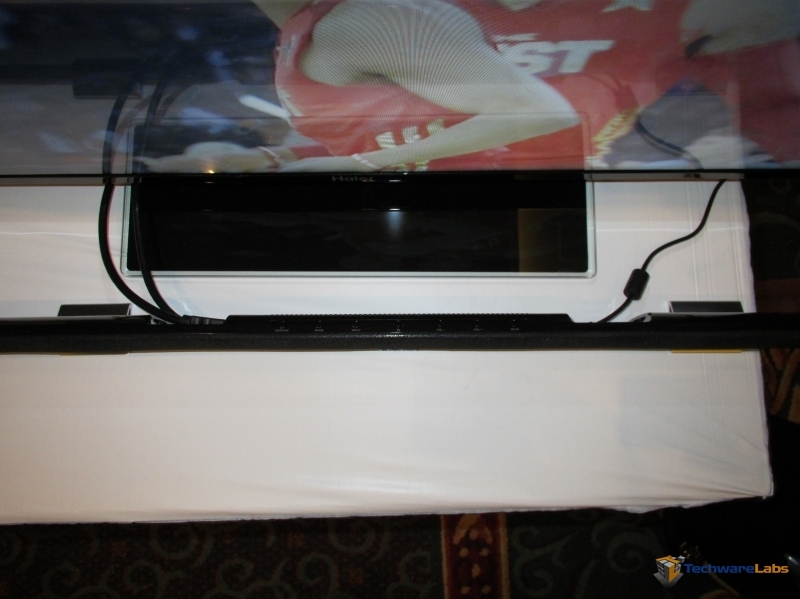 This soundbar measures 40″ and uses 6 speakers and 1 subwoffer in a 5.1 channel setup to achieve the ability to break the chains of a “Sweet Spot” like other sound/surround solutions. Instead the 3D Soundbar sounds the same no matter where the listener is in relation to the bar itself. While we were given a short preview of “3D Sound” we were not able to test this function thouroughly because of the noise level of the room. This concept is still a great idea for people constantly moving in an area (Kitchen, Outdoor deck, Garage) but wanting to have quality sound from a television. 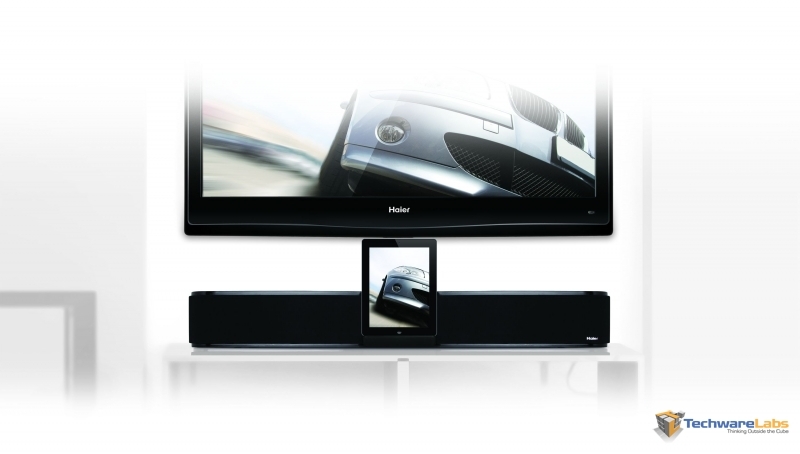 This Soundbar shows us the next step of where soundbars are heading: Slim and smaller without sacrificing sound. This bar measures 40″ across but less than width of a pencil deep (1.07″) in a 2.1 channel with external wireless subwoffer setup. We were given a 4-5 minute demonstration of the power that can be produced from this thin bar and I was Amazed! Normal intuition says the thinner the speaker the more shallow the sound but Haier has conqured this problem. This step in the Thin direction is great for people with TVs mounted on the wall. The thin profile of the Ultra Slim Soundbar makes it easily mountable and discrete around a theatre or media center. Haier recommends 6-8′ of distance between the subwoffer and the bar itself but says it’s rated up to 30′. More than enough to easily install and remove some of the wire clutter. We look forward to recieving and throughly testing these products from Haier at a future date.